Scavenger Hunts are a great way to celebrate virtually any occasion, and since they can be customized to accommodate an individual plan and purpose, they are an obvious choice for every personality and age group. All you need to begin is an occasion worth celebrating, some scavenger hunt list ideas, a little creativity, and possibly a few tips on how to write fun and challenging scavenger hunt clues. Celebrating holidays are the perfect opportunity for a theme scavenger hunt. Create a red, white, and blue list for the Fourth of July. Prepare an Easter egg riddle list for Easter. Use this twelve days of Christmas video hunt list to ring in the holiday season. Send participants on a quest to find orange items or specific costumed trick-or-treaters for Halloween. Test your guests' knowledge with a Constitution scavenger hunt list. 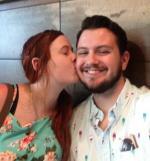 Pair couples off with a romantic Valentine’s Day list. Create a scavenger hunt full of fun and adventure by appealing to participants wild side. For the truly brave at heart, devise a thrill seekers video list including such things as bungee jumping, rock wall climbing, or tight rope walking. Throw caution to the wind with a dare list that could include such things as posing as a mannequin in a store window or serenading a stranger. For the less reckless, yet still bold, try a get fit photo list with stops involving line dancing or batting cages. Create a camping supplies list or a list of things found at a campground. Plan an in the woods hunt where participants discover animal prints, make leaf rubbings, or identify different plants or berries. If you are more of a city slicker, but still enjoy the fresh air, there are plenty of scavenger hunt ideas that are perfect for the outdoors. Compile an around the town list requiring participants to travel to various businesses and landmarks. Give everyone a sand bucket and send them off with a day at the beach list. Build a company picnic hidden objects list. Create a sports equipment list. Compile a sports trivia list. Divide participants into teams and send them to various sports facilities with a sports challenge list. One of the most interesting and exciting scavenger hunts is the popular treasure hunt where clues lead to a final reward or ‘treasure‘, and with a little bit of thought and creativity, the options are limitless. Have participants follow a map of cryptic riddles hidden in their pirate treasure hunt list. Explore the terrain with an ancient archeology treasure hunt list. Race for the fabled gold mine with a wild west treasure hunt list. Dazzle participants while encouraging them to explore their star qualities with a That’s Entertainment theme scavenger hunt. For Oscar season create a Hollywood movie list. For a family hunt compile a Disney characters list. Add a little quirkiness by developing a night at the circus list requiring teams to acquire items including balloons, wigs, and pictures of elephants. Visit the future with a science fiction scavenger hunt. Create an outer space list including items related to the planets and galaxies. Compose a Star Wars list sending participants on a quest to find light sabres and futuristic books. Write an alien hunt list that has everyone traveling to discover evidence of ‘other world’ visitors, pre-planted of course. Make a modern technology list including cell phones, digital cameras, and computers. Design a charity focused scavenger hunt by creating "For the Health of It" lists. Make a pink list for National Breast Cancer month. Write a use your breath list to raise money for the Lung Association, requiring participants to videotape people blowing up balloons, playing a wind instrument, or whistling. Create a list of health products and supplements for teams to gather. Build a list of activities to be completed at various health stores and gyms. Celebrate the passage of time and honor the uniqueness of various generations by hosting a name the decade scavenger hunt. Create a 60s hippie list or a through the generations video dance list. Compile a Name that Tune list where clues are given using lines from songs spanning several time periods. There are also several exciting and creative options for those who prefer an indoor scavenger hunt with smaller, more defined boundaries. Make a find that book/quote list for a library hunt. Compose an ingredient list for a grocery store hunt. Use this purse scavenger hunt list. Prepare a clothing item list for a mall hunt. Of course, a race to complete an internet hunt is also a popular choice. a find that flower list. a deck of cards lists. For the collector, have participants acquire a particular item from specific people or locations, such as baseball caps and figurines. For a more ‘hands on‘ approach, ‘build’ or ‘construct’ a scavenger hunt that will appeal to the more practical and purposeful participants. Create an ingredient hunt list and have teams use their spoils to bake a cake or cook a casserole. Devise a supply list and have participants complete an object from a designated plan. This would also work for decorating a Christmas tree, designing a flower garden, or sewing a dress. Create a solve that crime clue list. Design a princess for a day list. Make a for the honeymoon list or a household needs list. Create an over the hill list or a How Well Do You Know the Guest of Honor riddle list. that you would like to share? Great! Share it here! To be accepted lists must consist of at least 8 items, challenges, etc. (whatever applies to your list) and clear instructions on how to play. Your Scavenger Hunt will appear on a Web page exactly the way you enter it here. You can wrap a word in square brackets to make it appear bold. For example [my list] would show as my list on the Web page containing your story. 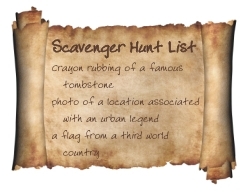 Do you have a picture or yourself to add or one that compliments your Scavenger Hunt list? Great! Click the button and find it on your computer. Then select it.